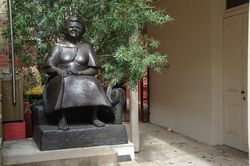 Statue erected in memory of "Mum Shirl".
" Mum Shirl " was a powerful advocate for Aboriginal rights and welfare. She assisted in setting up the Aboriginal Medical and Legal Service in Redfern in the 1970s, visited prisoners in gaols and opened her home to the addicted and homeless. Colleen Shirley Perry, tireless community worker, died on 28 April 1998 aged 73. Shirley was born on the Erambie Reserve, Cowra, of Wiradjuri descent. She moved with her family to Sydney in the mid 1930s. Not long after the move, one of Shirley’s brothers went to jail. Visiting her brother in jail would start a lifelong and tireless involvement in welfare work. 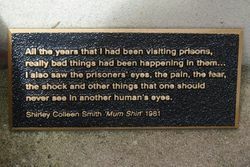 After his release, the New South Wales consorting laws prevented her brother from maintaining contact with his friends in jail, so Shirley continued the visits on his behalf. Her nickname arose from her habit of replying, "I’m his Mum", whenever officials queried her relationship with the prisoners. Eventually the authorities recognised the value of her support for prisoners and allowed her access to any prisoner she wished to visit. Her caring continued beyond prisons, with many people with no family or friends in Sydney arriving at Mum Shirl’s Redfern house seeking shelter. By the early 1990s she had reared over 60 children. never see in another human`s eyes.